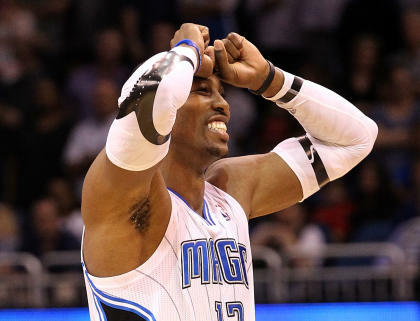 The Cleveland Cavaliers are no longer willing to be third-team facilitators for a blockbuster trade that would send Orlando Magic All-Star center Dwight Howard to the Brooklyn Nets, severely jeopardizing the Nets' ability to acquire Howard, league sources told Yahoo! Sports. The development has pushed the Magic to continue negotiating with several teams, especially two teams in the Western Conference: the Los Angeles Lakers and Houston Rockets. The Rockets could be the most intriguing possibility for the Magic because they can satisfy Orlando general manager Rob Hennigan’s desire to get multiple draft picks and unload significant salary off his payroll. The Lakers have the one player, Andrew Bynum, that Hennigan covets, but Bynum hasn't committed to accepting an extension in Orlando, nor do the Lakers have the salary-cap space or ready access to draft picks. Brooklyn needed Cleveland to take free-agent forward Kris Humphries in a sign-and-trade deal, so the Nets could clear the necessary salary-cap space to absorb the contracts of three Magic players, including Howard, Jason Richardson and Earl Clark. Several league executives with knowledge of the negotiations believe the small-market Cavaliers had become sensitive to criticism they were contributing to the construction of another big-market super power. Brooklyn has left the Magic with several scenarios of direct deals between the two teams, but with the moratorium on free-agent signings ending on Wednesday, the Nets are losing the ability to keep their own free agents needed for a sign-and-trade with Orlando – Brook Lopez, Humphries, Damion James and Shelden Williams – from seeking out deals elsewhere in the league. The Nets have been engaged with Lopez’s representatives on a maximum contract extension, and if they feel like the possibility of acquiring Howard is slipping away, they’ll likely move to complete a deal with the restricted free agent in the next few days. The Magic received medical reports on Lopez on Tuesday morning, and league sources said Orlando officials have concerns about committing four years of near-maximum contract money considering that he broke his foot twice last season and appeared in only five games.